If you are willing to witness and live the genuine Cypriot spirit, then Bellapais Gardens is the right place. It is located beside the amazing Bellapais Abbey, right on the edge of Lawrence Durrel's village. This is an awesome place resting in the arms of peace and serenity. The hospitality of this place is tremendous, that you will be welcomed as a family member and will be taken care as one. Its not only located at the entryway of abbey but also in the vicinity of Five Finger Mountain chain. This is a humble and sumptuousness hotel with authentic country-style shelter in Cyprus. Adding to the comfort, you can get cozy with your loved ones at the fireplace. 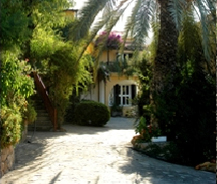 Bellapais Gardens is the real and truest Cypriot accommodation on the Mediterranean island. They believe in making you feel comfortable to the core which is the most pleasing factor about the place. You can ease your souls imbibing cocktails and enjoying the authentic Cypriot cuisine. The astonishing view from hotel rooms and our restaurant will undoubtedly leave you speechless. The overall panorama of the place is just mind blowing and ravishing. Once you leave Bellapais Gardens, you will miss the golden sunshine, traditional cuisine and the splendid view, which is indeed a sight heaven on earth. You will have an experience of lifetime at Bellapais Gardens.